Chasing some questionable intelligence, and removing herself from the circus of Hawkeye's upcoming trial, Mockingbird boards a super-hero-themed cruise ship where the source's need for secrecy, an encounter with a former boyfriend, and a murder all stand in the way of Bobbi finding what she seeks. 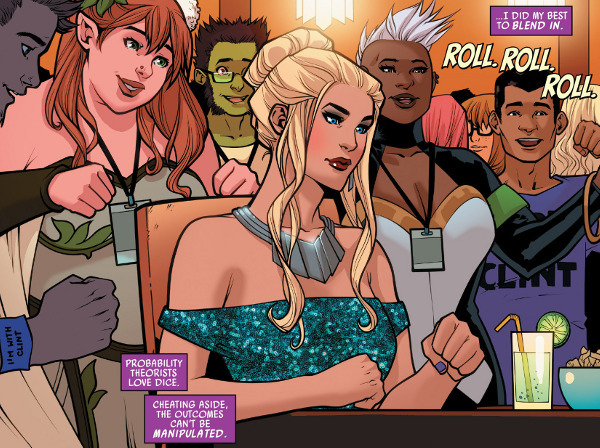 Mockingbird #6 finds a way to tie-in the events of Civil War II without forcing the reader to know more than the basics about Marvel's latest big event. The series continues its goofy style with the latest issue, complete with a Corgi convention on the same cruise line and Bobbi's consistent struggle to find any useful information on a boat headed straight for the Bermuda Triangle (and likely even more trouble). Knowing that Hawkeye has confessed to the crime, I'm a little confused as to what exactly Mockingbird is seeking (or what intel eventually gets her skittish contact killed), but the strange backdrop sets up a murder-mystery I'll be interested in watching the Avenger solve. Worth a look.